It’s a Tall World after all! My husband is a big Starbucks fan – so I’m hoping this great news might get my Decaf Dude to come to the parks with me more often! 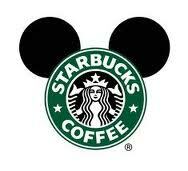 The one and only Starbucks announced today that they will soon have a presence at all the Disney theme parks. You’ve got to be a California girl (or boy) to be the first to see it. Starbucks says they will open the first of six Starbucks locations in June at Disney California Adventure and then Disneyland Park. Disneyland guests can enjoy their “ pick me up” at the brand new Fiddler, Fifer and Practical Café. The Fiddler location will be themed to the 1920’s vision of Buena Vista Street. Sounds pretty cool to me! Not long after – Florida will be “perked-up” Seattle style in the Walt Disney World resort! More specifically, we will enjoy Starbucks in Magic Kingdom, Epcot, Hollywood Studios, AND Animal Kingdom. The new locations will serve coffee, espresso, frappuccino, signature Starbucks sandwiches, pastries, and desserts. Please note the Swan and Dolphin Resorts on Walt Disney World property have served Starbucks for quite a while. These resorts aren’t Disney owned. Now we can make magical memories right inside the parks without sacrificing our morning cup of joe from Starbucks!